"The ecosystem we’re creating will connect biology, experience and AI so that we can learn how diseases manifest in the body over time, and how our everyday actions contribute to their progression"
CAMBRIDGE, Mass.--(BUSINESS WIRE)--PatientsLikeMe, the world’s largest personalized health network, has entered into a broad-ranging partnership with digital life company iCarbonX to apply next generation biological measures and machine learning, and accelerate a deeper understanding of the basis of human health and disease. iCarbonX, founded in 2015 by renowned genomicist Jun Wang, has taken a minority equity position in PatientsLikeMe and will provide multi-omics characterization services to the company. Invus, LP, PatientsLikeMe’s anchor investor for the past decade, is also participating in the equity investment. The partnership makes PatientsLikeMe a cornerstone in iCarbonX’s Digital Life Alliance, an expanding ecosystem of leading health technology and application companies that are collaborating to digitize and analyze all aspects of life. The alliance’s ultimate aim is to merge comprehensive biological and patient-generated data with artificial intelligence (AI) technology to help people better understand the medical, behavioral and environmental factors in their lives that may accelerate or mitigate disease, and optimize health. In a separate announcement today, Wang said that the iCarbonX ecosystem has invested a total of nearly $400 million in the initial companies that form the alliance: PatientsLikeMe, SomaLogic, HealthTell, AOBiome, GALT, Imagu and Robustnique. PatientsLikeMe has spent the last 10 years developing a sophisticated personalized health network that has empowered patients in their own health journey, pioneered patient-centered measures of health and disease, and amplified the patient voice to the healthcare industry. The company was founded by Heywood, his brother, Ben, and family friend Jeff Cole after the Heywoods’ brother Stephen was diagnosed with amyotrophic lateral sclerosis (ALS). The trio built what became the first and only digital platform to date to collect and aggregate patient-generated health data, giving patients the real-world context to make more informed decisions and improve their outcomes. Today more than 500,000 people use patientslikeme.com to track and share information about 2,700 conditions. The result is a unique window into the patient experience unavailable in any clinical system that also helps PatientsLikeMe’s partners improve medicines, devices, and treatment protocols. More than 40 pharmaceutical companies and numerous government organizations have collaborated with PatientsLikeMe and used its data to understand what it’s like to live with and treat disease. The company has also published more than 100 research studies based on patient-generated health data. 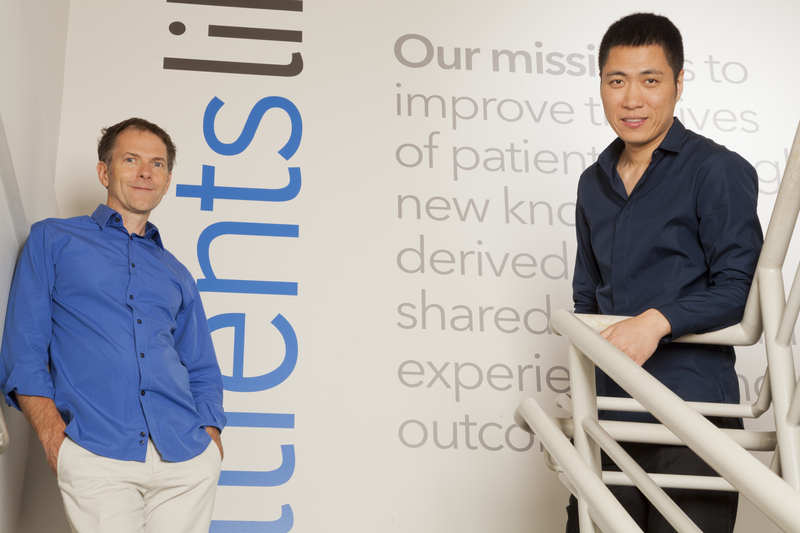 The new PatientsLikeMe board of directors is comprised of: Jamie Heywood; PatientsLikeMe CEO Martin Coulter; Philippe Amouyal, Managing Director of Invus LP; Jun Wang; and Co-Founder and COO of iCarbonX Chun Wu. PatientsLikeMe, the world’s largest personalized health network, helps people find new options for treatments, connect with others, and take action to improve their outcomes. The company has worked with every major pharmaceutical company and a range of government organizations to bring the patient voice to research, development and public policy. With more than 500,000 members, PatientsLikeMe is a trusted source for real-world disease information and a clinically robust resource that has published more than 100 research studies. Visit us at www.patientslikeme.com or follow us via our blog, Twitter or Facebook.